video.news.sky.com The number of people killed in the biggest freeze to hit Europe in decades has risen to over 300. The Ukraine has been hardest-hit, while Bosnia has declared a state of emergency after a combination of avalanches and strong winds left hundreds of villages cut off. Sky’s Geraldine Cooper reports. At least three people have been killed and dozens injured after a plane crashed at an air show in the US The aircraft came down near the grandstand during the Reno Air Races competition in northern Nevada. The 74-year-old pilot of the World War II plane is one of those who died. 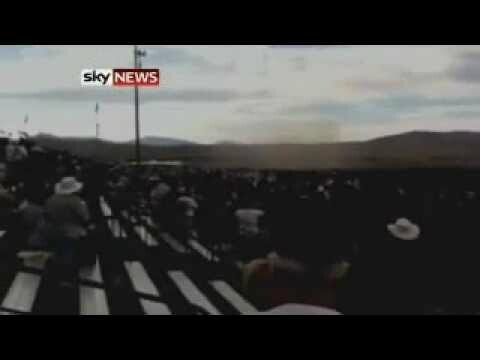 The crash was filmed by one of the spectators. NOTE: Enda Brady’s report contains images of the immediate aftermath of the crash. More about this programme: David Walliams and his mum, Miranda Hart and her on-screen mum Patricia Hodge battle it out on The Generation Game, hosted by Vernon Kay. As the teams learn how to throw their pots and prepare to put a handle on them, mischief ensues.